Reagans: Battle In A Culture War? "The Reagans" miniseries might have been pulled because of disagreements over its script, but media critics from the right and left say it reflects broader issues. They just don't agree on which ones. CBS' decision was applauded by fans of the former president, who were worried the film scheduled to air Nov. 16 and Nov. 18 would distort Ronald Reagan's legacy. "This reminds us all that the American people have a strong voice in deciding what is fair and appropriate," said U.S. Rep. Eric Cantor, R-Va. Yet critics disgusted by the furor of a movie virtually no one has seen — part of a trend of pre-emptive strikes on controversial entertainment projects — said a dangerous precedent was set. "If the decision not to air 'The Reagans' was made in response to political pressure, it will have a chilling effect on future creative efforts in this genre," said Herb Sargent, president of the Writers Guild of America, East. "Even under the threat of advertiser boycott, networks must not allow special interest groups to dictate programming." The four-hour miniseries, scheduled to air on CBS during this month's big ratings period, depicted Nancy Reagan as controlling, and Mr. Reagan at times confused, CBS News Correspondent Jerry Bowen reports. After taking "The Reagans" off its schedule in the face of political pressure, CBS said Tuesday it would license the film to Showtime, a corporate cousin and pay cable network with about one-fifth of CBS' audience. "A free broadcast network, available to all over the public airwaves, has different standards than media the public must pay to view," CBS said in a statement. "We do, however, recognize and respect the filmmakers' right to have their voice heard and their film seen." CBS said it was not bowing to political pressure, but said it was concerned about balance when the movie it ordered as a love story about Ronald and Nancy Reagan turned out politically pointed. The miniseries became a hot topic on talk radio and the TV news networks. The chairman of the Republican National Committee wrote to CBS President Leslie Moonves, asking for historians to review the movie, and the conservative Media Research Center asked advertisers to consider boycotting the film. Brent Bozell, founder of the Media Research Center, scoffed at the notion that CBS was stifling free speech. "There is no such thing as creative license to invent falsehoods about people," Bozell said. "I don't care who you are. You don't have that right." Supporters of the former president, who suffers from Alzheimer's Disease, said there's no evidence he said that. "CBS invented things out of whole cloth, which defamed the man," Bozell said. Some conservatives were unhappy that the program would be aired at all. "I don't know the misinforming fewer viewers on Showtime solves the problem," said Jim Dyke Republican National Committee. Michael Reagan, the president's son, told the CBS News Early Show the program "took away the compassion of my father." 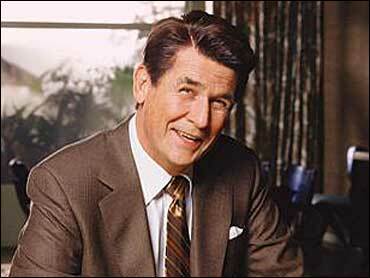 "I think if there had been no controversy, the show certainly would have been on CBS," Reagan said. "It began a firestorm that they had to take a look at their own product to find out, in fact, it was biased and not in favor of Ronald Reagan and didn't show a balanced view of my father and, therefore, they pulled it." However, the conservative groups who lambasted "The Reagans" raised no objection to another fictionalized portrayal of a Republican president on Showtime — but that was a depiction of President Bush in the days after the Sept. 11, 2001 terrorist attacks. Liberal critics saw the controversy as reflective of the larger "culture wars" in which conservatives have opposed gay romance on network television and artwork deemed disrespectful to religious figures. Producers Neil Meron and Craig Zadan noted that CBS had approved their script in advance. While disappointed by CBS' decision, they said they were pleased Showtime would air the miniseries. Showtime and CBS are both owned by Viacom, which is anxiously awaiting federal action on rules to restrict ownership of local TV stations. Failure to enact such changes could cost Viacom millions of dollars, said Jeff Chester, head of the Center for Digital Democracy, a communications lobbying group. Viacom needs help from Republicans in the White House and Congress who might not like seeing Reagan portrayed negatively, Chester said. "They made a business decision," he said. "In doing so, they clearly caved in to the political pressure." It's not likely CBS faced much pressure from advertisers, said Brad Adgate, analyst for Horizon Media, an ad-buying firm. Some advertisers might have been scared by the controversy, but many would have been attracted by the prospect of big ratings, he said. Robert Thompson of Syracuse University told the Early Show that CBS has now angered just about everyone. "For one thing, people are mad at them they made it in the first place and the rest of the country that aren't mad at them for that, are mad that they buckled," he said. "You want CBS to have control of its content, to make stuff that it's willing to stand by if they think is important." "This is not some big dark day of a triumph of censorship, it's the conspiracy of the marketplace and we've seen it a million times before," he said.